For a long time, a great way to get introduced to wooden ship modeling for both young people and adults has been by building the simple modeling subjects produced by Midwest Products. In fact, many members at Hyde Street Pier Model Shipwrights have recommended these kits for their relatively easy construction, excellent plans and classic all-American subjects. 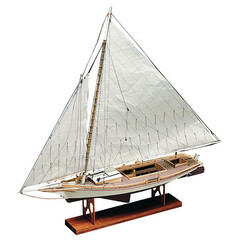 So, it’s sad to announce that Midwest has discontinued production of its wooden boat kits. These kits are still available in stores and online, but they are increasingly difficult to find as they sell out and can’t be restocked. So, if you’ve been thinking about building one, you might want to go and and buy it if you can find it. Fortunately, these have been in production for a long time and there are many of the kits still widely available on Amazon.com and probably in many hobby stores. With luck, kit production will be picked up by another manufacturer, but you never know. Certainly according to Midwest, they’re getting a lot of phone calls about the boat kits, so maybe they’ll change their minds. One can only hope. But, the best way to make sure these are back in production is to build them, buy them, ask for them at your local dealer, or contact Midwest at 800-348-3497 or info@midwestproducts.com. This entry was posted in News and tagged Midwest Products by catopower. Bookmark the permalink.